by Chris Woodford. Last updated: September 26, 2018. The Romans must have been particularly pleased with themselves the day they invented lead pipes around 2000 years ago. At last, they had an easy way to carry their water from one place to another. Imagine what they'd make of modern fiber-optic cables—"pipes" that can carry telephone calls and emails right around the world in a seventh of a second! Photo: Light pipe: fiber optics means sending light beams down thin strands of plastic or glass by making them bounce repeatedly off the walls. This is a simulated image. Note that in some countries, including the UK, fiber optics is spelled "fibre optics." If you're looking for information online, it's always worth searching both spellings. Photo: A section of 144-strand fiber-optic cable. Each strand is made of optically pure glass and is thinner than a human hair. Picture by Tech. Sgt. Brian Davidson, courtesy of US Air Force. 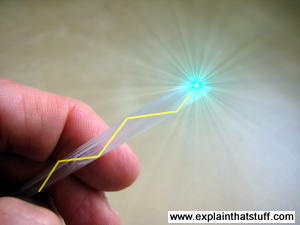 Photo: Fiber-optic cables are thin enough to bend, taking the light signals inside in curved paths too. Picture courtesy of NASA Glenn Research Center (NASA-GRC). 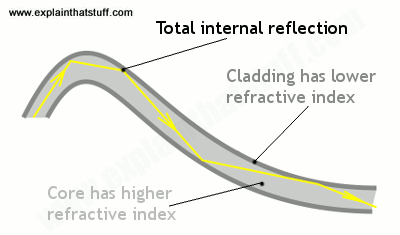 Artwork: Total internal reflection keeps light rays bouncing down the inside of a fiber-optic cable. 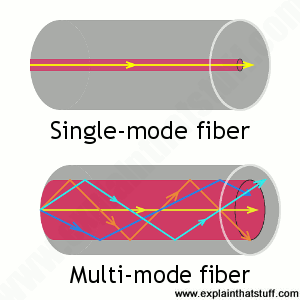 The simplest type of optical fiber is called single-mode. It has a very thin core about 5-10 microns (millionths of a meter) in diameter. In a single-mode fiber, all signals travel straight down the middle without bouncing off the edges (yellow line in diagram). Cable TV, Internet, and telephone signals are generally carried by single-mode fibers, wrapped together into a huge bundle. Cables like this can send information over 100 km (60 miles). Another type of fiber-optic cable is called multi-mode. Each optical fiber in a multi-mode cable is about 10 times bigger than one in a single-mode cable. This means light beams can travel through the core by following a variety of different paths (yellow, orange, blue, and cyan lines)—in other words, in multiple different modes. Multi-mode cables can send information only over relatively short distances and are used (among other things) to link computer networks together. This nice little experiment is a modern-day recreation of a famous scientific demonstration carried out by Irish physicist John Tyndall in 1870. It's best to do it in a darkened bathroom or kitchen at the sink or washbasin. You'll need an old clear, plastic drinks bottle, the brightest flashlight (torch) you can find, some aluminum foil, and some sticky tape. Take the plastic bottle and wrap aluminum foil tightly around the sides, leaving the top and bottom of the bottle uncovered. If you need to, hold the foil in place with sticky tape. Switch on the flashlight and press it against the base of the bottle so the light shines up inside the water. It works best if you press the flashlight tightly against the bottle. You need as much light to enter the bottle as possible, so use the brightest flashlight you can find. Standing by the sink, tilt the bottle so the water starts to pour out. 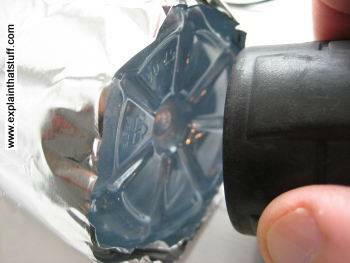 Keep the flashlight pressed tight against the bottle. If the room is darkened, you should see the spout of water lighting up ever so slightly. Notice how the water carries the light, with the light beam bending as it goes! If you can't see much light in the water spout, try a brighter flashlight. Photo: Seen from below, your water bottle should look like this when it's wrapped in aluminum foil. The foil stops light leaking out from the sides of the bottle. Don't cover the bottom of the bottle or light won't be able to get in. The black object on the right is my flashlight, just before I pressed it against the bottle. You can already see some of its light shining into the bottom of the bottle. Higher bandwidth: As we've already seen, fiber-optic cables can carry far more data than copper cables of the same diameter. 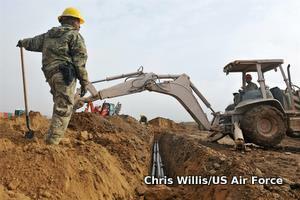 Photo: Fiber-optic networks are expensive to construct (largely because it costs so much to dig up streets). 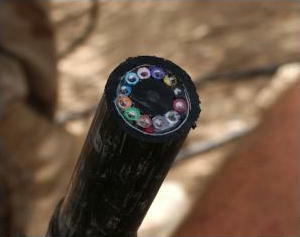 Because the labor and construction costs are much more expensive than the cable itself, many network operators deliberately lay much more cable than they currently need. Picture by Chris Willis courtesy of US Air Force. Cable TV companies pioneered the transition from the 1950s onward, originally using coaxial cables (copper cables with a sheath of metal screening wrapped around them to prevents crosstalk interference), which carried just a handful of analog TV signals. As more and more people connected to cable and the networks started to offer greater choice of channels and programs, cable operators found they needed to switch from coaxial cables to optical fibers and from analog to digital broadcasting. Fortunately, scientists were already figuring out how that might be possible; as far back as 1966, Charles Kao (and his colleague George Hockham) had done the math, proving how a single optical fiber cable might carry enough data for several hundred TV channels (or several hundred thousand telephone calls). It was only a matter of time before the world of cable TV took notice—and Kao's "groundbreaking achievement" was properly recognized when he was awarded the 2009 Nobel Prize in Physics. Apart from offering much higher capacity, optical fibers suffer less from interference, so offer better signal (picture and sound) quality; they need less amplification to boost signals so they travel over long distances; and they're altogether more cost effective. In the future, fiber broadband may well be how most of us watch television, perhaps through systems such as IPTV (Internet Protocol Television), which uses the Internet's standard way of carrying data ("packet switching") to serve TV programs and movies on demand. While the copper telephone line is still the primary information route into many people's homes, in the future, our main connection to the world will be a high-bandwidth fiber-optic cable carrying any and every kind of information. One of the latest developments is called a lab on a fiber, and involves inserting hair-thin fiber-optic cables, with built-in sensors, into a patient's body. These sorts of fibers are similar in scale to the ones in communication cables and thinner than the relatively chunky light guides used in gastroscopes. How do they work? Light zaps through them from a lamp or laser, through the part of the body the doctor wants to study. As the light whistles through the fiber, the patient's body alters its properties in a particular way (altering the light's intensity or wavelength very slightly, perhaps). 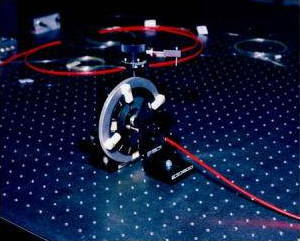 By measuring the way the light changes (using techniques such as interferometry), an instrument attached to the other end of the fiber can measure some critical aspect of how the patient's body is working, such as their temperature, blood pressure, cell pH, or the presence of medicines in their bloodstream. In other words, rather than simply using light to see inside the patient's body, this type of fiber-optic cable uses light to sense or measure it instead. Photo: Fiber optics on the battlefield. 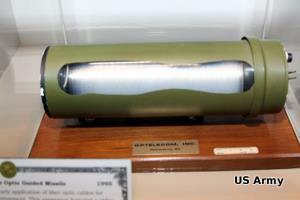 This Enhanced Fiber-Optic Guided Missile (EFOG-M) has an infrared fiber-optic camera mounted in its nose so that the gunner firing it can see where it's going as it travels. Picture courtesy of US Army. 1840s: Swiss physicist Daniel Colladon (1802–1893) discovered he could shine light along a water pipe. The water carried the light by internal reflection. 1870: An Irish physicist called John Tyndall (1820–1893) demonstrated internal reflection at London's Royal Society. He shone light into a jug of water. When he poured some of the water out from the jug, the light curved round following the water's path. This idea of "bending light" is exactly what happens in fiber optics. Although Colladon is the true grandfather of fiber-optics, Tyndall often earns the credit. 1930s: Heinrich Lamm and Walter Gerlach, two German students, tried to use light pipes to make a gastroscope—an instrument for looking inside someone's stomach. 1950s: In London, England, Indian physicist Narinder Kapany (1927–) and British physicist Harold Hopkins (1918–1994) managed to send a simple picture down a light pipe made from thousands of glass fibers. After publishing many scientific papers, Kapany earned a reputation as the "father of fiber optics." 1957: Three American scientists at the University of Michigan, Lawrence Curtiss, Basil Hirschowitz, and Wilbur Peters, successfully used fiber-optic technology to make the world's first gastroscope. 1960s: Chinese-born US physicist Charles Kao (1933–2018) and his colleague George Hockham realized that impure glass was no use for long-range fiber optics. Kao suggested that a fiber-optic cable made from very pure glass would be able to carry telephone signals over much longer distances and was awarded the 2009 Nobel Prize in Physics for this ground-breaking discovery. 1960s: Researchers at the Corning Glass Company made the first fiber-optic cable capable of carrying telephone signals. ~1970: Donald Keck and colleagues at Corning found ways to send signals much further (with less loss) prompting the development of the first low-loss optical fibers. 1977: The first fiber-optic telephone cable was laid between Long Beach and Artesia, California. 1988: The first transatlantic fiber-optic telephone cable, TAT8, was laid between the United States, France, and the UK. 2018: According to TeleGeography, there are currently around 450 fiber-optic submarine cables (carrying communications under the world's oceans), stretching a total of 1.2 million km (0.7 million miles). 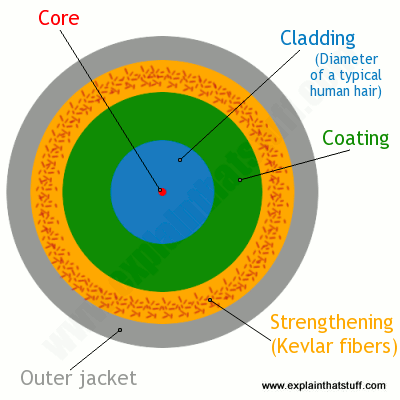 Understanding Fiber Optics by Jeff Hecht. Laser Light Press, 2015. A very comprehensive, clearly written overview with relatively little math. Optical Network Design and Implementation by Vivek Alwayn. Cisco Press, 2009. A comprehensive technical guide covering all aspects of fiber-optic networks. City of Light: The Story of Fiber Optics by Jeff Hecht. Oxford University Press, 1999. How fiber optics went from being a minor scientific curiosity to an indispensable feature of modern telecommunications, used by every single one of us, every single day! Eyewitness: Light by David Burnie. Dorling Kindersley, 1998. A good, solid introduction to the physics of light from the popular DK Eyewitness series. Suitable for ages 9–12. Scientific Pathways: Light by Chris Woodford. Rosen, 2012/Blackbirch, 2004. One of my own books, this one charts how scientists have tried to understand light from ancient times to the present day. Suitable for ages 9–12. Remembering the Remarkable Foresight of Charles Kao by Jeff Hecht, IEEE Spectrum, 25 September 2018. Looking back at the life and work of the fiber-optic pioneer. Is Keck's Law Coming to an End? by Jeff Hecht, IEEE Spectrum, 26 January 2017. What are the limits for fiber-optic bandwidth and are we approaching them? How Charles Kao Beat Bell Labs to the Fiber-Optic Revolution by Jeff Hecht. IEEE Spectrum, 15 July 2016. The author of a popular book about fiber-optic history describes how Charles Kao figured out the theory of modern fiber-optic communications a half century ago. New Mode of Transmission May Double Fiber Optic Capacity by Charles Q. Choi, IEEE Spectrum, 25 June 2015. A new way of sending data could boost the capacity (or range) of a fiber-optic cable by 2–4 times. Is fibre optic cable key to Africa's economic growth? by Gabriella Mulligan, BBC News, 31 March 2015. Will fiber-optic networks help African countries to grow economically? Or are satellite and wireless communication a better bet? Laser puts record data rate through fibre by Jason Palmer, BBC News, 23 May 2011. Scientists explore new ways to send data down fiber-optic cables at higher rates. Nobel Prize in Physics 2009: Masters of Light: Explains the important contribution made by fiber-optic pioneer Charles Kao to our modern world of digital information. Nature's 'fibre optics' experts by Matt Walker, BBC News, 10 November 2008. How sea sponges funnel light using a similar technique to fiber optics. Fiber optic cables: How they work: Engineerguy Bill Hammack carries out a slightly more sophisticated version of the experiment up above. Understanding Lasers and Fiber Optics: MIT's Professor Shaoul Ezekiel gives us a much more detailed introduction to lasers and fiber-optics. Suitable for undergraduates (and perhaps advanced high school students). Optics for Kids: Educational activities for children from the Optical Society of America.